The Winter Meetings begin Sunday, December 9 in Las Vegas, and before team personnel arrive in Las Vegas, it is the teams of the NL East who have been involved in most of the action going on with regards to acquisitions. The Nationals, Braves, Phillies, and Mets all improved this week through acquisitions. The Nats acquired Yan Gomes, the Braves acquired Josh Donaldson and Brian McCann, the Phillies acquired Jean Segura, and the Mets got Robinson Cano and closer Edwin Diaz. There will be more moves to come. 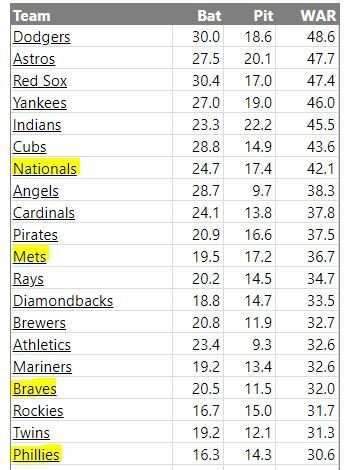 The projected standings will change again tomorrow after Fangraphs updates for the Mets and Phillies acquisitions. It will be very interesting to see the impact of all of the moves. While the Phillies acquired Segura, they traded Carlos Santana and J.P. Crawford which will most likely move Rhys Hoskins from leftfield to 1st base. For the Mets, they did not give up much in terms of major league talent as Jay Bruce did not figure prominently into the Mets 2019 team. It is important to be cognizant of the fact that when a new player is acquired — he is replacing a player(s) with WAR that must be netted out. For instance, Josh Donaldson of the Braves replaces much of the playing time of Johan Camargo. While Donaldson is a projected +4.1 WAR, Camargo had a projected positive WAR. The Braves team WAR increased with with the Donaldson and McCann acquisitions with a net of +3.2 WAR increase. The Nationals are still projected to win the NL East this morning by Fangraphs with 90 wins. These projections of course are subject to change with every acquisition, and the real test is staying healthy and playing the actual games to determine the winners and losers in the real standings. Projections are fun, but games are not won on paper. 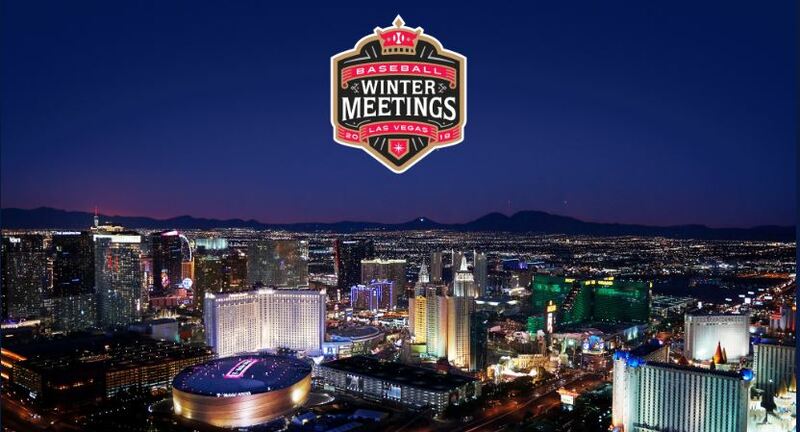 MLB Network will produce extensive coverage of the 2018 Baseball Winter Meetings in Las Vegas starting on Sunday, with insiders Peter Gammons, Jon Heyman, Ken Rosenthal, Joel Sherman and Tom Verducci who will be reporting live across more than 45 hours of on-site programming. The Winter Meetings across all of MLB’s media platforms will be presented by the advisory, assurance, and tax firm CohnReznick. which was founded in the Washington, D.C. area as an accounting firm specializing in real estate. Now, as an international advisory and accounting juggernaut in their industry, they have stepped up as the title sponsor of these Winter Meetings. As part of the collaboration with Cohn Reznick’s sponsorship, MLB Network has produced a new series, Business of Baseball, which will explore the strategic issues franchises tackle on and off the field, such as enhancing the fan experience or leveraging data and analytics. The series will begin with MLB’s first-ever GM roundtable conversation with Mike Rizzo (Washington Nationals), Alex Anthopoulos (Atlanta Braves), Rick Hahn (Chicago White Sox), and Dayton Moore (Kansas City Royals) and moderated by MLB Network host Brian Kenny and analyst and former GM Dan O’Dowd. Excerpts from the discussion will be featured across MLB Network programming this week, followed by a one-hour show on Saturday, Dec. 8 at 8:00 p.m. ET. “Baseball is more than a game, it’s a business built on a foundation of strategy and leadership. That is why we are proud to support this unique content, taking fans behind the scenes to understand the business side of America’s pastime,” said Frank Longobardi, CEO of CohnReznick. Interviews with club managers and general managers, insights into club strategy, and player analysis from MLB Network’s Mark DeRosa, Kevin Millar, Dan Plesac and Harold Reynolds will be featured across programming and social media from Las Vegas, beginning with MLB Tonight on Sunday, Dec. 9 at 8:00 p.m. ET. Each of MLB Network’s off-season studio shows will air live on-site from Monday, Dec. 10 through Thursday, Dec. 13, beginning with Hot Stove at 9:00 a.m. ET, followed by High Heat with Christopher Russo, MLB Now, Intentional Talk and MLB Tonight. In exclusive social-first content produced each day, MLB Network’s on-air personalities will also offer their takes on player trades and signings, and provide a behind-the-scenes look at the Winter Meetings, including the PBEO Job Fair and the Baseball Trade Show. MLB Network’s coverage will also feature the Today’s Game Era election results announcement from the National Baseball Hall of Fame on Sunday, Dec. 9 during MLB Tonight. Harold Baines, Albert Belle, Joe Carter, Will Clark, Orel Hershiser, Davey Johnson, Charlie Manuel, Lou Piniella, Lee Smith and George Steinbrenner were named last month as the candidates for the Today’s Game Era Committee’s consideration for the Class of 2019. With a week of blockbuster trades, this could be another busy week leading into the Winter Meetings when more trades are expected as well as Patrick Corbin‘s announcement of which team he plans on playing for in 2019. The three teams that are thought to be in the finals for his services are the Nationals, Yankees and Phillies. Our sources have told us the Nationals have been in contact with Corbin since their initial meeting last week, and it includes a strong offer from general manager Mike Rizzo. The Nationals and Yankees fit geographically with what Corbin is looking for near family and a ‘vibrant’ city. The Nationals should also have the tax advantages over the other cities in contention for Corbin’s services, and you can use the same criteria for Corbin that we did for Bryce Harper except the strategic deferrals unless Corbin made his post-retirement home in a tax haven state like Florida. Along with Corbin, there are several other top of the rotation starting pitchers available including Dallas Keuchel, J.A. Happ, Nathan Eovaldi, and Charlie Morton plus there are other starters available via trades. That philosophy has worked well in the past, but in 2018, only Max Scherzer met expectations. In addition to starting pitchers, there is a large supply of second basemen available in free agency including some lefties who could also play some first base. That would seem to be another area of need for the Nationals. So far, Mike Rizzo has made four quick strike moves acquiring Kyle Barraclough, Trevor Rosenthal, Kurt Suzuki and Yan Gomes. Would it surprise anyone to see Rizzo make another move or two before he arrives in Las Vegas?